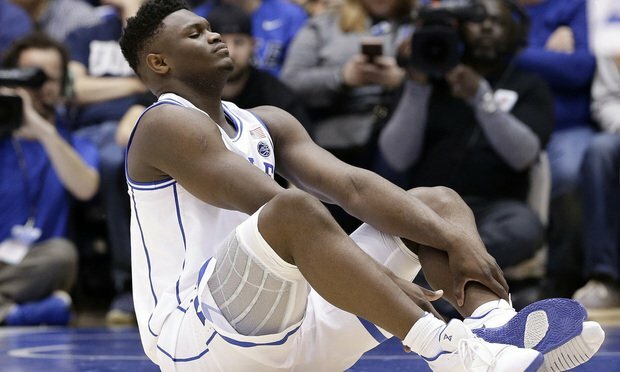 Duke basketball star Zion Williamson’s shoe ripping apart during the first minute of one of the most highly anticipated college games of the season caused a knee injury, a lost game and a $1 billion stock drop for Nike. But, according to several attorneys, one thing the incident is unlikely to spark is a lawsuit. The incident happened Feb. 20 during a high-profile game against Duke’s bitter rival, the University of North Carolina Tar Heels. Video of the incident shows Williamson, who is widely anticipated to be the NBA’s No. 1 draft pick, attempting to stop abruptly while dribbling at the top of the key, but, instead of stopping, his left foot broke through the Nike PG 2.5 shoe he was wearing. Williamson then fell to the ground, clutching his knee. He was later found to have sustained a sprain. According to several attorneys, the star forward has a clear case against several parties involved, and, depending on what contracts are at play, Duke could have claims as well. But damages could prove to be a high hurdle for any potential plaintiff to surmount, and on top of it all, Nike, which, attorneys agreed, has the highest potential for liability, will likely want to head off any claims before they create another negative news cycle for the sneaker giant. Jay Edelson, a leading attorney in a class action against the NCAA over concussion litigation, offered similar sentiments, saying that, although Williamson could pursue numerous claims, any disputes are likely to resolve behind the scenes. Kline and others agreed that having the shoe split in the middle of a game appeared to be a textbook example of a products liability case, where a product failed during the course of its normal use. The likely defense to that claim would focus on whether Williamson—who is listed as 6′ 7″ and 284 pounds—used the shoes improperly, but attorneys said this defense is weak. “The product was designed specifically for athletes, and more specifically for Duke,” Hanna said. Kline said that, in states like Pennsylvania, which allow for strict liability claims, the plaintiff might not even need an expert to prove their case. The incident, however, happened in North Carolina, which does not follow strict liability, but instead requires proof of negligence. Kline said that may require some expert testimony, but Williamson’s claim would still be very strong. Attorneys said Williamson could also make a claim against Duke for negligence for breaching its duty to generally protect their players, but Williamson isn’t the only one who has a potential claim, according to attorneys. Duke, which has a contract with Nike to be the school’s exclusive supplier for footwear through 2027, could also make a claim against Nike for breach of contract. Kline also said Duke could bring a products liability claim, because if they purchased the shoes, they also have the expectation the shoes won’t split during regular use. But a lawsuit from Duke would be unlikely, attorneys said. “I would be very stunned if Duke were to sue Nike because the relationship between colleges and the Nikes of the world is something which I don’t think either of them would want a big spotlight to be put on,” Edelson said. The amount of money that could potentially be at issue is staggering. In the immediate aftermath of the incident, Nike’s stock dropped by more than $1 billion, although that drop was quickly erased. Resale tickets for championship games also often top $1,000. And with starting the starting salary for the No. 1 draft pick ranging up to $8 million, the losses Williamson could sustain if he is chosen even as a 10th-round pick could be as much as $4 million in salary—and that’s without counting potential endorsements. But regardless of the amounts, attorneys agreed that plaintiffs would be hard-pressed to clearly connect any economic injuries—be they demotion in the draft picks or lost sales tickets on behalf of Duke—to the single incident. Kline said Williamson could have an easier time proving his economic losses if it affected his draft pick, but any claim about the season ending earlier than anticipated due to the injury would be even more difficult to make. “That would take a real crystal ball to prove that,” Kline said. It does appear that the team was looking ahead when it reportedly purchased an insurance policy with $8 million, according to The Action Network’s Darren Rovell. According to the report, the policy includes losses that could occur if Williamson’s draft standing is affected. Specifically, he would need to drop beyond the 16th pick. Although the injury is expected to sideline the star for Duke’s rematch against UNC set for Saturday, Williamson is expected to play in the upcoming ACC tournament beginning next week, so dropping that low is seen as very unlikely. Nike did not immediately return a message seeking comment.